Colorado Cabin mirrors are American made and designed with painstaking detail to create a unique look that can't be duplicated. We use local woods for building these mirrors and each piece is selected by hand to insure only the best quality. The mirrors are made with traditional methods and finished with natural bees wax. 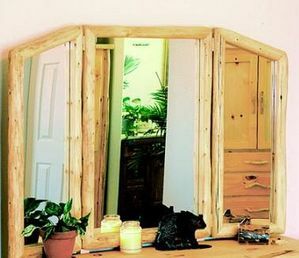 We can even make custom Colorado cabin mirrors, so you get exactly the cabin furnishings you want.